On the 23rd and 24th of January in Vienna, The Casimir Pulaski Foundation and the Institute of Human Sciences organized an event titled ”We Need to Talk. Time for a New European Security Dialogue?”. The event included a public discussion, and a closed seminar addressing current challenges for security, and perspectives for dialogue, settlements of conflicts and conflict prevention in the OSCE region (including Eastern Europe, Balkans, Caucasus and Central Asia). The Austrian Presidency in the OSCE and the Polish Permanent Mission to the OSCE supported the event. Walter Kemp, Senior Adviser to the Austrian Presidency, and Marcin Bużański, Peace and Stabilisation Strategies Programme director chaired the seminar. Ambassadors (or Deputy-Ambassadors) of 20 member states were present, together with experts and OSCE representatives, including: Ambassador Christian Strohal, the Special Representative for the Austrian OSCE Chairmanship, former Polish Foreign Minister Professor Adam Daniel Rotfeld, Paul Bekkers, the director of the OSCE Secretary General’s office, OSCE Conflict Prevention Centre’s Ambassador Marcel Pesko, the Deputy Chief Monitor of the OSCE Special Observation Mission in Ukraine Aleška Simkić, Ivan Vejvoda, vice-president of the German Marshall Fund, Professor Sergey Markedonov from the Moscow Institute of Military-Political Analysis, Ivan Krastev, the director of the Center for Liberal Strategies (Sofia), Stefan Lehne from Carnegie Europe (Brussels), Magdalena Grono from the International Crisis Group (Brussels), Wolfgang Danspeckgruber, the director of the Liechtenstein Institute on Self-Determination (Princeton University). 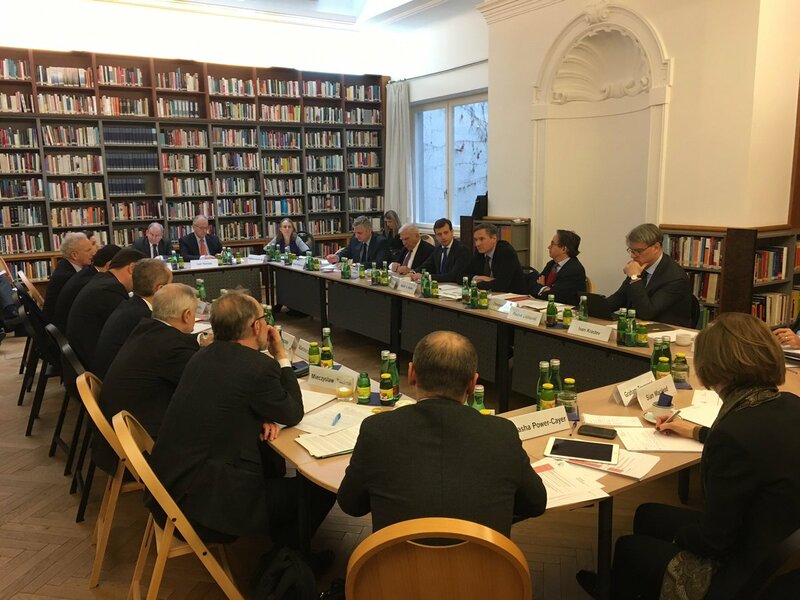 The initiative was met with positive responses from participants, creating an informal consultative forum on the future of security dialogue under the Austrian presidency in 2017. Russia’s violation of the principle of inviolability of borders through the annexation of Crimea forced the organisation to look for answers about the durability of the frames of the post-Cold War order in Europe. They are also under stress due to a persisting wave of populism on the eve of the French and German elections, the on-going migrant crisis, and a rise in cybersecurity threats. Questions were raised about preserving unity of the West in multilateral approach to the European security architecture. Possible changes in the global role of the US signalized by the new administration (including in international organizations) add to the doubts in this matter. In this context, increasingly un-cooperative positions of Russia in talks with European partners are observed. Simultaneously, participants noted an urgent need to respond to the conflicts in the region, strengthening preventive diplomacy, and confidence building measures. Under such conditions, the organization is tasked with developing frames of a ”structured dialogue”, adopted as a goal by the OSCE Ministerial Council in Hamburg, and perspectives for the shape of such a dialogue have been discussed. Participants noted that specifics of the organization (it includes the post-Soviet and Euro-Atlantic space) and its political challenges (for instance it includes both democratic and authoritarian states) make it fragile, and less forceful. A the same time, because of them it can serve as useful platform for the East-West dialogue, which could establish the Special Monitoring Mission in the East of Ukraine and the Russian-Ukrainian border, and create substantial aquis in arms control and confidence-building measures. The meeting gave space to discuss a broad range of instruments in conflict prevention, conduct of peace missions, arms control, confidence-building measures and other issues. It was agreed that to retain influence, the OSCE member states need to carry out key reforms (such as modernization of the Vienna Document), improve the visibility of its successes and make the organization more effective in using the resources for risk assessment and prevention of new conflicts – particularly in the Balkans. A systematic approach to a political solution of the Crimea annexation standoff is also necessary. However it cannot go against principles of the international law. The increasingly complicated international surroundings and dynamics of change make it necessary to urgently establish a form of ”structured dialogue” in the OSCE framework in a way that makes it possible to retain key rules and achievements of the organization, confirm security guarantees and ensure continued effectiveness and visibility of its current activities. Many of conclusions and recommendations worked out during the sessions would be considered when a special working group is established to deal with the issues described.